In a Vision of the Apocalypse, What Fate Awaits the People of Africa? Jean Bapteur, “The Eagle of Misfortune,” from an illuminated copy of the Apocalypse, circa 1428-34. 410 by 290 mm (page). Tucked away at the base of a distant mountain, a tightly knit group of black figures await their destiny as the temporal world disappears before the cataclysmic force of divine retribution. This brightly colored scene makes up one of 49 pictorial illuminations from a lavishly ornamented manuscript of the Apocalypse, a terrifying account of the cataclysmic end of earthly life and the institution of the eternal kingdom of God. Also known as Revelation, it was written by a late-first-century visionary generally known as John the Divine and forms the transcendent conclusion of the Christian Bible. This illuminated Apocalypse was painted by the Swiss miniaturist Jean Bapteur for Amedeo VIII, duke of the important northern-Italian state of Savoy. The crowded scene depicted here illustrates verse 13 from the eighth chapter of Apocalypse. A vision of a wrathful eagle hovers in an azure sky, bearing an ominous portent of calamity to be visited on a sinful world. From its mouth comes the fateful words, rendered in Latin: Ve ve ve habitantibus in terra, or “Woe, woe, woe to the inhabitants of the earth.” At the point in the text where the eagle appears, four of the seven trumpets of doom have already sounded, destroying a third of the world and the heavens. Angels holding the last three trumpets stand at the left in this illumination, ready to unleash disasters that will further ravage the world and separate the righteous from the wicked at the Last Judgment. The meaning of the events related in the Apocalypse is hard to discern. The inhabitants of the earth who are to be excluded from the holy body of the elect are those not of the Christian faith. Here the artist represents a vision of a world populated by three distinct groups of people, all menaced by the eagle hovering above them. The figures on the three hills correspond with the three continents known at the time: Europe, Asia and Africa. On the far-right side of the scene stands a circle of Jewish men and women, identified by the red-and-white badges that they were forced to wear in many parts of Europe at this time. Some of the men gather around an open book of holy Scripture, discussing the meaning of the portent. To the left of this group, engaged in similar debate, is gathered a group of Muslim sages in exotic costumes. Finally, just behind the three angels stands a circle of six black people, five men and one woman. All are focused intently on the heavenly apparition. They are dressed in checked garments and cluster around a man wearing a white robe edged in gold. Clad in sumptuous garb resembling a regal or ecclesiastical vestment, he stands out as the leader of the group. The fate of the three groups seen here—Jews, Muslims and Africans—seems one of imminent disaster. However, nowhere in the Apocalypse are they explicitly mentioned. The treatment of the phrase “inhabitants of the earth” has been rendered literally by the artist and in pointed reference to non-Christian people. The disturbing exclusion of most of the earth’s population from salvation visually encodes the animosity of the time toward perceived threats to the safety of the Western Christian church and its faithful. The group of black people in the left background depicts the scarcely known civilizations of sub-Saharan Africa. Physiognomically accurate depictions of blacks appear in European art at least by the 13th century. Artists had little direct knowledge of Africa and its people, however, and therefore fell back on a potent visual trope to characterize those who inhabited the vast continent. The black men gesturing toward the eagle all wear twisted headbands trailing long, fluttering ribbons. Known as a tortil, this type of head cloth would have been instantly recognizable by contemporary Europeans as a defining characteristic of the Moor’s head, a heraldic emblem widely used since the Middle Ages. The Moor’s head is always shown in strict profile, isolated against the background of a coat of arms or banner. A barely visible example of this motive appears here on the flag above the city of the blacks. The meaning of the Moor’s head varies considerably according to its use throughout Europe. It can represent the defeated enemy, the ideal of military expansion, the warrior saint Maurice or simply a pun on a patrician family name. Here, the multivalent character of the Moor’s head is transformed into animated flesh-and-blood figures set in the real world. It now becomes a symbol of the African in his own land, the distant other in the European imagination. The great powers of Europe had long sought a closer relationship with the venerable Ethiopian Orthodox Church. Founded in the fourth century, this vibrant black community of faith followed a unique form of Christianity. Just several years after Bapteur painted this illumination, an embassy from the Ethiopian church journeyed to Rome to attend an ecumenical council meant to unify all branches of Christian belief. The mission ultimately failed but did bring about the direct awareness among Europeans of this distant Christian nation. In a remarkable synthesis of the emerging knowledge of Africa with the persistent appeal of legend, Ethiopia gradually became associated with the elusive, long-sought kingdom of the powerful Christian ruler Prester John. Widely regarded in Europe as the ruler of Ethiopia, Prester John took on the aspect of a savior figure, a potential ally of both the Western and Eastern Christian churches. The black man in the gold-trimmed robe in this scene may allude to the fabled leader. Although Christian, adherents of the Ethiopian Orthodox Church differed from their European counterparts in their particular formulation of the divine and human aspects of Christ. 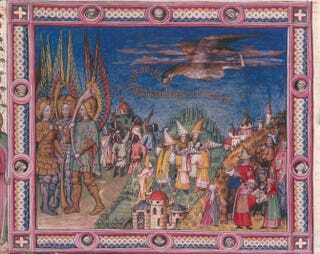 In this case, the black figures in the scene would be considered heretics by the Roman Catholic Church, placing the people of this rich land in peril of divine retribution. In an eerie correspondence with contemporary events in Europe, dire biblical prophecy would become enmeshed with historical reality. Shortly after Bapteur’s work on the manuscript was finished, Portuguese explorers brought back the first slaves from the West African coast. By the end of the 15th century, the association of black Africans with forced servitude had become thoroughly established. Another apocalyptic scourge now awaited them in the form of a ravaged homeland and the trials of existence in a world not of their own making.